Claudio Scardovi, managing director and head of Financial Services for EMEA at Alix Partners: professor at Bocconi University, at SDA Bocconi, and at Imperial College. Springer International Publishing, October 2016. 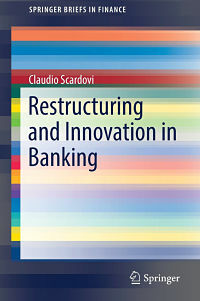 In this chapter, Scardovi considers Schumpeter’s framework of ‘creative destruction’ and how it could apply to financial services, as a result of the remnants of the past financial crisis and of the profound changes introduced by quick digitization. The chapter also discusses why creative destruction has so far been very limited because of the generally accepted wisdom that ‘banks cannot fail’. It reviews the causes of the Lehman Brothers failure, what could happen if a SIFI (Systemically Important Financial Institution) were to fail, and what systemic impacts this could bring about. The chapter then discusses why a ‘bankaround’ (a significant turnaround of banking) is now long overdue and almost inevitable. Access the chapter (or the full eBook) here: Creative destruction in the Global Financial System.